Photography, video and graphic design by Jon Brown. Based in Nottingham, East Midlands. See the portfolio and read the latest blog post. Welcome to Beard and Bible - the creative hub of Jon Brown. Looking for a photographer, graphic design or video? You've come to the right place. I'm Jon, a creative media freelancer based in Nottingham, and it's great to have you here. Welcome to the Beard and Bible blog - the thoughts and work of Jon Brown. View latest work, photography tips, beard maintenance advice, thoughts of life, and cute cat videos (ok, maybe not them). Creative Media Nottingham, East Midlands. Photographer, Designer, Videographer, Blogger. The MORE > Real is available for free here. This study guide is designed to be used either on your own or in a group. Read through the chapter and then take some time reflecting on the questions. Be as honest as you can and try not to skip the more awkward questions. You might find it helpful to write your answers in a journal. The study guide works well in pairs or small groups. Each chapter has an Ice Breaker, designed to get people talking before the questions go a bit deeper. It’s worth having a Bible to hand as some of the discussion revolve around specific passages and stories from the Bible. You’ll know your group dynamics and needs so feel free to adapt the questions or add in new ones. At the end of each section there is a Creative Moment and Next Step. The Creative Moment may take a bit of preparation (e.g. getting some pens and paper) and the Next Step is worth following up during the week. As always, group discussion will be far better if people are open and honest. If you model this then you’ll set the tone and others will follow. Struggle with being open and honest? Read the Real Relationships chapter! The first review of my book has come in! Big thanks to blogger. Tom Creedy for reading it and sharing his thoughts. Check out his site here or read below. Seeing the MORE series come to life has been really encouraging. I loved Calvin Samuel’s MORE: Distinct, which is about holiness, and have been enjoying the others in the series. 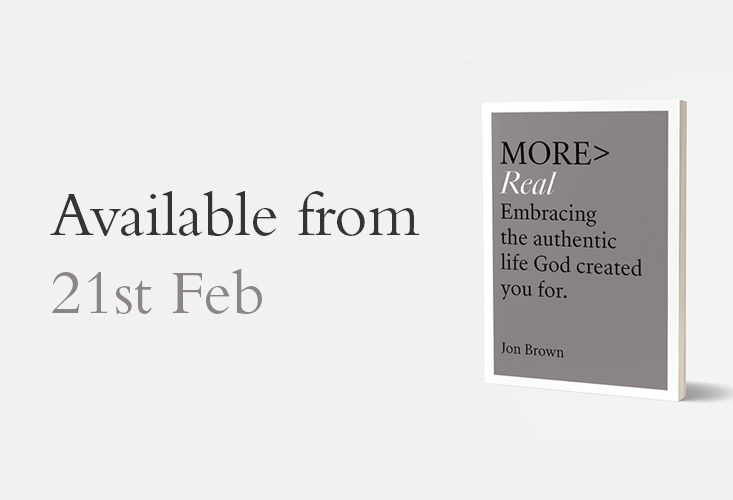 Jon Brown’s MORE: Real, which I’m reviewing today, might be one of the most honest books I’ve ever read. This is a book that is full of questions – and that is because Jon is keen not to just tick the box of writing a book, but rather wrestle with reality. Early on, that wrestling is shown profoundly, as he writes “Living with doubt can be an extremely isolating experience. Who can you talk to? You worry you might unsettle your Christian friends, but you don’t want to tell your non-Christian friends and bolster their scepticism“. This isn’t a book about doubt – it is a book about authenticity, in a real, Jesus-focused sense – but for a person prone to doubt, it is a very helpful little book to read. Following the design of the MORE books to date, MORE: Real is nicely designed, and best read physically. And in that, I think it unintentionally (or perhaps intentionally) echoes a theme that resonates throughout Jon’s words. We have a problem with social media in our culture. Jon nails it, in my opinion, when he writes “We can trick ourselves into thinking that we’re growing relationally as a society, but the truth behind the shiny veneer of our digital age is that there is a relational deficit“. Before I get the obligatory stream of comments that usually accompany criticising social media – particularly on a blog regularly shared by myself on social media – can I point to the fact that Jon is getting to something true and beautiful. Whatever our reasons for using social media and other digital tools of connection – and there are many, such as connecting with housebound or ill friends, or geographically distant friends and family – the digital world is subtly different and darker and less real than the real world. I think MORE: Real‘s discussion of this is well worth the price of the book. Ultimately, though, this is a book about Jesus. Jon opens and closes with reference to, and a serious trust in, one of my favourite Bible verses (John 10:10. Google it, it’s beautiful). In the closing chapter of MORE: Real, Jon writes this: “Was Jesus wrong? No. When he promised life and life to the full, he meant it. When the Bible promises that we can taste and see that the Lord is good, it can be trusted“. It takes more than a hundred pages to get to that set of thoughts, and that answer to that question. And those pages clearly represent an authentic distillation of Jon’s life. I want to warmly and ferociously recommend this book to different people. Firstly, I think it is good for those of us demographically designated as ‘millennial’, whether currently part of churches or who used to be part of churches. Secondly, I think it will be helpful and informative for those seeking to relate to and pastor people like that. Finally, I think it is a great primer on what a biblical, Jesus-focused vision of authenticity could be like. Dropped my first freestyle. I wish. Not quite as exciting but still kind of cool. Had fun recording the audiobook version of my book with @ladbrokeaudio. Watch the videos I took on the day here. When Elizabeth from IVP first approached me with the idea of writing MORE > Real I wasn’t hard to convince. I loved the idea and had a few things I needed to get off my chest. I’ve spent the last decade watching friend after friend walk away from Jesus and I’ve come close myself. It’s caused me to wrestle with some uncomfortable questions. Jesus said that he offers ‘life and life to the full’ and the Bible claims that we can ‘taste and see that the Lord is good.’ If that’s God’s promise then why do so many people reject it? Why do so many people walk away? And not just teenagers but these are my friends in their twenties and thirties and beyond – people who have been in church for years. Is it that God isn’t good or is it that people haven’t ‘tasted’ the real thing? If indeed God is good then have we misunderstood what it means to experience him? Have we presented a relationship with God that’s not based on the reality and truth of the gospel. I think we have, and I think we need to talk about it if we want to have genuine relationships with God. In MORE > Real we look at central aspects of following Jesus, what’s fake and what’s real. Exploring how we relate with God and how we relate with other. We look at heartfelt, raw prayer, authentic and vulnerable relationships, the growth and faith that’s possible during times of doubt and disappointment. We explore the hope and happiness that’s available for us to taste and see when we really know who Jesus is and all he’s done. This book, like the others, points readers back to the Bible and encourages them to mine the eternal truths that it contains. Its accompanying, free study guide (available at ivpbooks.com/more-resources) enables readers to use the book in both devotional and small group settings. My prayer is that this book saves someone from walking away from church or walking away from God. My prayer is that no one else feels alone. My prayer is that every reader would come away with a greater peace, greater confidence and greater desire for authentic relationship with God and others. I was approached about writing a book. I said yes and have spent the past 18 months working on it. I’ve rebooted and reshaped this website to be a central hub for people to find the resources we’re creating for the book.